Elephants can grow to in excess of 5 tons, tearing through trees, brush, and even houses. They are roamers by nature, and they care little about obstacles in their way. When an elephant is born into captivity the owner of the newborn elephant ties the animal to a tree or post with a rope and chain to prevent the elephant from escaping. As the baby elephant grows the tether is continually tested in his attempts to free himself, but since he is a baby, his efforts are no match for the rope and chain. As the elephant grows bigger, his attempts to break free become less and less frequent as he learns that he is no match for the rope. Ultimately the elephant simply gives up any attempts to free himself, and resigns himself to a life of capture, believing that his strength will never be enough to overcome his restraint. An adult elephant, having been conditioned by his past experience can now easily be tethered to a tree with the thinnest of ropes. He makes no attempt at freedom because he carries with him for life the belief that he does not possess the strength and power to break the ties that bind him. Remember the rope does not physically bind the elephant, it is not strong enough, the rope simply serves to confine the animal’s mind, reinforcing the belief that the elephant’s current capabilities are no greater than they were when he was small. 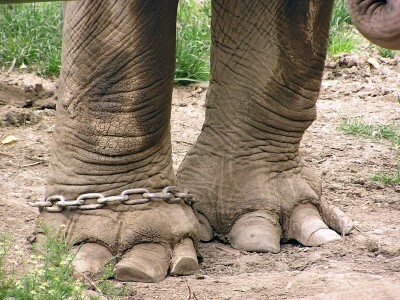 The thinnest of ropes can bind the largest elephant, simply because the elephant believes that it can. Like the elephant, how many of us go through life hanging onto a belief that we cannot do something, simply because we failed at it once before?